Tucked away in a quiet corner of the bustling Four Seasons Hotel in Austin with SXSW excitement buzzing all around, Matthew McConaughey and Richard Linklater arrive to talk about their film Bernie. 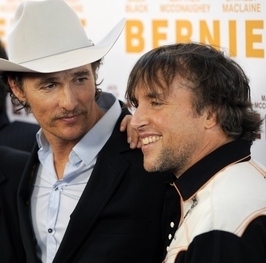 The two have worked together and been friends since we first saw McConaughey in Linklater’s Dazed and Confused (1993). Their rapport is obvious as the two casually open up about their latest endeavor. Bernie is a twisted, quirky comedy; the true story of a beloved and cheerful small-town mortician who befriends the meanest (and wealthiest) widow in town and ultimately kills her. It stars Jack Black as Bernie, Shirley MacLaine as Marjorie Nugent, and Matthew McConaughey as District Attorney Danny Buck Davidson. The following is an edited transcript of the discussion in which 10 journalists were invited to ask questions. MM: What have we got here… A Time to Kill, Amistad, Lincoln Lawyer and this … yeah. QUESTION: And you wanted to be a lawyer originally, you were pre-law? MM: I did. That’s where I was headin’. Then I luckily ran into a friend of ours, Don Phillips, in a bar and he introduced me to this guy (motions to Linklater). And yeah, this is much more fun. QUESTION: How does Bernie fit into your “J.K. Livin” philosophy? MM: Well one, Rick’s the director, the only director I work with that can go “Hey, I think I’ve got something for ya. Let’s get together and talk about it.” The process of getting to the day of shooting is really fun for Rick and I. There’s nothing formal about it all. We really play. It doesn’t take us that long. RL: Yeah, the process for this one was just a couple days. MM: And it’s just he and I, one on one. And I always look forward to that. And so, that’s a part of JK Livin philosophy right there, the fact that he’s a good friend and I like to work with him. The work is so much better when you have fun and I always have fun working with him. QUESTION (to RL): In this film, there’s the opportunity to do some one-on-one research for the multiple roles. Did you seek out the real-life people? RL: I started with Bernie and then talked to Scrappy (the defense attorney) as well. Jack wanted to meet Bernie so we facilitated that. I went to the trial about 15 years ago. I was into it back then. I wanted to see him testify. So yeah, it’s tricky when you do something that’s based on real events, real people. You know, I was concerned about the families and you try to be as accurate as you possibly can. QUESTION (to RL): Why did you use the sort-of documentary style of the town characters? RL: You’re talking about all the gossips? The townspeople? I just thought having grown up in a small town… and I hadn’t really seen that before. If you think about it that’s how I received the story. Mrs. Nugent is gone. Bernie’s in prison. So you have no access to the players, right? So what are you? In a way you’re whatever people say about you. So we hear the gossip from a lot of different angles. I was reading a stack of Skip’s journalistic notes (Skip Hollandsworth wrote an article about the trial for Texas Monthly, and he co-wrote the screenplay), that’s when it hit me. Like… gossips… yeah. It’s all the same event from different experiences. That’s when I got the idea in my mind that gossips would tell the story. You know, I went to that trial and saw it. They were excited. Gossip is fun, especially in a small town. It’s human, but it’s especially strong in a small town. QUESTION (to MM): Matthew, how did he describe the story? On paper it could seem really, really dark, and your kind of humor is a bit more whimsical, I suppose. So when he described the story to you, how did he play it? MM: I was pretty much onboard when I read it. I thought it was the funniest thing he’d done on paper. I thought it was very, very funny. There’s an innocence about Rick, he has a bit of charm that he gives. There’s something about him, either your charm or you give that kind of charm… (to RL) You’re charming. (laughs) It’s just moving. There was something innocent about it that attracted me in that way. I never read this and thought, no it’s too dark. When I read it, I felt on pace with the tone. I thought it was much more funny than dark. RL: I don’t really think it’s dark. I mean, it’s described as a dark comedy only because there’s murder in it, the darkest subject you can think of. But Bernie’s life I don’t… it only had a few seconds of darkness. QUESTION: How much did you exaggerate the characters for comic effect? RL: Danny Buck’s gonna be at the screening tonight so you can see for yourself. RL: Jack so nails Bernie. He got his walk exactly. He was working on the accent thing because we had some recordings of Bernie that he was going on, like one at a church service. But then when he finally met Bernie and got to hang out with him, that was it. QUESTION: Was the Shirley MacLaine character really that bad in real life? RL: Oh, yeah. Shirley was talking to Ms. Nugent (motions to the sky, Ms. Nugent is the murder victim), so she had that connection. QUESTION: I totally understood everything the characters were saying, but sometimes you’ll see a British film, like a Ken Loach film, where they have subtitles. I wonder if this film needs subtitles for the east and west coast. RL: I wonder if you have to. I had a friend from New York who saw it at a press screening. He called me up and said, “Don’t take this the wrong way, but I felt like I was watching a film from another country.” (laughs) Well, it kinda is. Even in Texas, it’s like another country, isn’t it? RL: I always wanted to do that in a movie because if you live here and you have friends not from Texas it’s hard to describe. It’s impossible. They’re like, “Oh, did you grow up like in a John Wayne movie?” And it’s like I grew up in an area that’s all woods. There’s trees in Texas. (laughs) Yeah, there’s all these different sections and I’ve been kinda wanting to break that down. I remember seeing a postcard when I was a kid about how Texans see the country, do you remember that? It’s like Texas goes all the way to Canada… (laughs), so we worked on that graphic. QUESTION: We wanted to ask you what it was like to work with your mom. MM: This is the guy to ask (points to RL) ‘cuz he’s done this in Newton Boys. He hired my oldest brother, Rooster, and put us in a scene together. (laughs) So she tells me they met … or auditioned for it? RL: She auditioned for it. MM: And she goes, “Rick says I’m just right for it.” So a couple weeks go by and I go, “So did he say you got the part?” And she says, “Well, I mean, Rick said I’m right for it.” And I go, “No, no, no, a director can say anything like that. Did he say you got the part?” And she goes, “No.” (mimics her heavy sigh, laughs) So I said, “You might be gettin’ a call-back. You better get after it some more” So I get her pumped up. I’m serious! I jacked with her. So she starts… I work with her one night on those lines, and she’s walking around for weeks sayin’ like, “Well, mAY-be…” (strong accent, laughs). So I’m workin’ with her and stuff and tellin’ her don’t worry about her lines, just relax, and be yourself. That’s probably what Rick would like the most. I don’t remember how it exactly went down but she finally got the formal “yes,” and then everything notched-up. (laughs) Then she’s in the movie. That’s great. But then there’s a scene where I’m in a café and old sneaky cat here (motions to RL) … who’s sittin’ next to me: He puts my mom in the scene. RL: It was in the script! MM: But there are all kinds of townies! RL: But did it say their names for all of ‘em? RL: She’s been trying to get in every one of your films. (laughs) She wanted to re-do The Graduate early on. QUESTION: Mrs. Robinson? Oh, that’s twisted! MM: So tonight I’ll be there, ya know, having a great time. QUESTION: What did she think of you in Killer Joe? QUESTION (to RL): Have you screened Bernie in Carthage yet? RL: No, not yet. We’re hoping to get a screening in the prison for Bernie. MM: Jack’s great in this, isn’t he? QUESTION (to RL): I know that Some Came Running is one of your favorite films and you’re finally getting to work with Shirley MacLaine. Did you bounce some thoughts off of her from that film? RL: No. You know when you’re working with someone with that kind of career, I never ask those questions. But she would offer things and she’s got her stories and experiences. QUESTION (to RL): Did she really meditate Mrs. Nugent? At this point the fellas were whisked away for more interviews elsewhere. The film screened at the Paramount Theater later that night, Wednesday March 14. Click here to read my review of Bernie.